New milk chocolate covered mint marshmallow tree peeps. 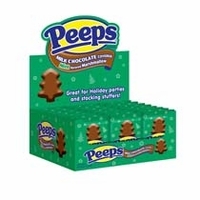 What's not to love about these, you get milk chocolate and peeps in a delicious treat shaped like a Christmas tree with a mint flavor. If you rather dark chocolate covered peeps we have them too.